Get rid of the noise with this must-have mod. 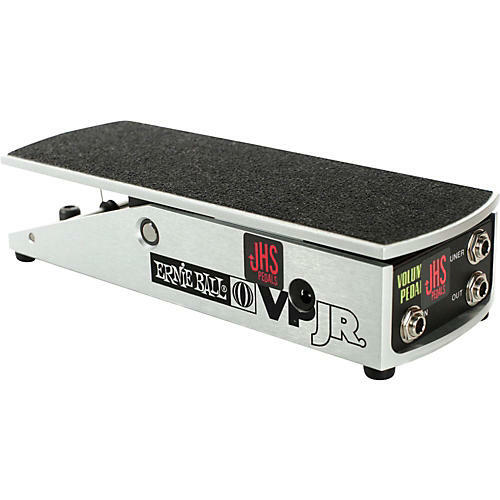 The Ernie Ball volume pedal is one of the most used pedals out there, and JHS has developed a mod that cures all the issues making this volume an awesome tool for more than just swells. They install their Buffered Splitter circuit to give you two truly isolated outputs for tuner and mono out. This eliminates ALL of the noise, tone loss, and removes the improper load on your signal. For those of you who want to use the tuner out function, this is a must have fix. The biggest benefit of this mod is that it makes your EB Volume active and buffered with their buffer circuitry. This will give you the best clean tone you may have ever had because it will drive your long path to your amp. The pedal in its stock condition is drastically hurting your tone (even when you're not using the tuner out). Because JHS installs their active buffered circuitry, you will now need to power the unit. Also, due to some mechanics, the stock Ernie Ball Taper switch will be removed during this Mod. As far as powering your modded pedal, use any standard 9v DC Negative power supply and your good to go! This pedal consumes less than 100mA.